This is a report syndicated with our colleagues of Germany's online magazine Fairaudio.de which can be read in its original German version here - Ed. Humans, animals, hifi sensations? - Jörg Dames & Ralph Werner in München. The dynamic range of the hifi/audio-gear market isn’t, to put it mildly, the highest under the sun. Even though computer & hifi caused somewhat of an energy injection into our sector, it’d be exaggeration to talk of growing pains. Against this status, how did the industry mosh of High End Munich 2012 do? Exhibitor numbers against two years ago were up a fat 40% and nearly 9% over last year. 366 firms attended, one for each day of the year, all vying for the attention of their captive audience. A good upswing? Exhibitor growth was made up of one third domestic, one third Europe without Germany and the remainder North America and Asia. High End is becoming more global. This also was confirmed by impressions of walking the halls of the M.O.C. not only relative to exhibitors but attendees. Naturally fairaudio was there to chase excitement. Let’s first stay in Europe and look north. 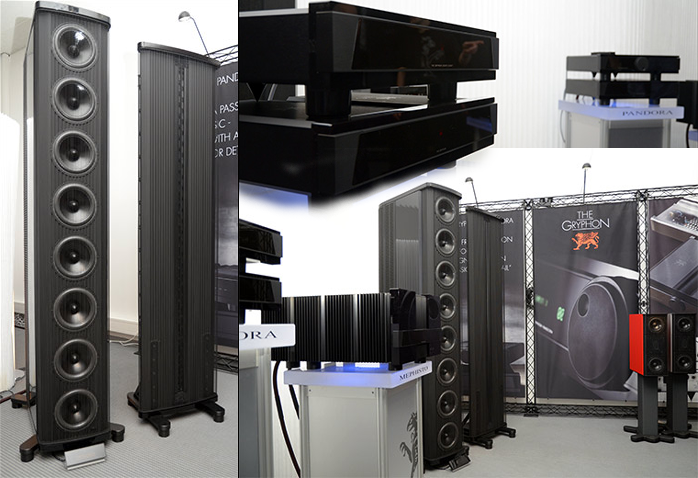 High End done right was the motto in our first destination exhibit of Gryphon Audio Designs. Though these Danes have never been known for affordable entry-level stuff, the new launches under the winged lion banner could cause hiccups even with the affluent. First to mention is the new reference speaker system called Pendragon (head dragon) consisting of four imposing towers, two for bass, two for the mid/treble. Since this system gobbles up real estate real quick, Munich made do with just one channel. A few facts perhaps? Each bass tower weighs 240kg and contains its own amplification. The Pendragon thus is a semi-active system with 1KW continuous and 4KW peak power. Eight 8-inchers per side do the bass biz for a lower reach to 6. Yes, six Hertz. Infrasonics. Finally. The handover frequency to the second tower at 200Hz sees a wideband ribbon as an open-baffle line source for broad horizontal but narrow vertical dispersion. This makes for a democratically wide sweet spot with minimal floor and ceiling reflections says Gryphon. The sticker for this four-chassis two-way dragon king is €150.000. This turns the €20.000 for the matching Legato Legacy phono stage with external power supply into near chump change. Those not into vinyl but in need of a preamp can reach for the twin-chassis Pandora which separates power supply and amplification circuitry, Gryphon’s third novelty at the event. €30.000 get you into Pandora's box. Those wanting both can install a Legato Legacy module inside the Pandora and get off for €8.000. The fully committed will include the new Mephisto power amp in mono trim which will weigh down the living room floor boards by 108kg each, warm the cockles in class A and lighten the wallet by another €100.000. Not even half an hour into the show and already down for $300.000 on one system. Not bad! Staying in Scandinavia we departed Denmark for Finland and Genelec’s very sizeable display with its own stage trimmed out with their largest 1036A studio monitors between which Canadian songstress Brook Miller belted out a few songs (the lady is under contract with the audiophile Stockfisch label). What was a pro-audio firm doing at a consumer show? 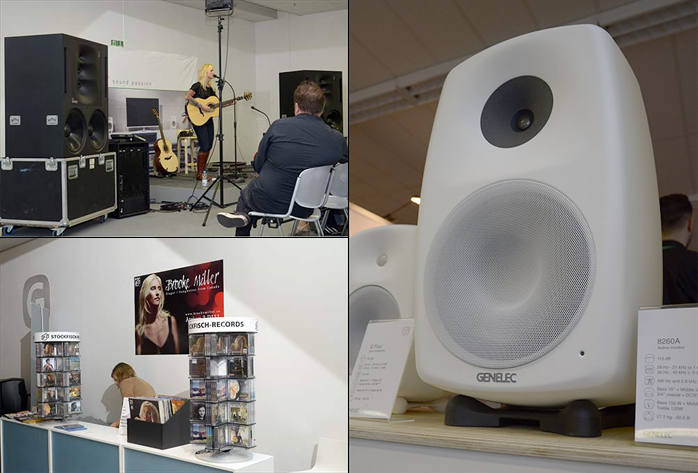 Genelec wants to shake up our scene. They introduced a 4-deep 2-way range plus two subwoofers. Available in September, the G One through Four monitors in the firm’s trademark round-over aluminium clam-shell chassis didn’t yet sport final stickers but will likely occupy a spread between €500 to €2.000/pr. The cast alu enclosures don’t merely look the business but incorporate a tweeter waveguide for a seamless dispersion transition to the mid/woofer whilst the edgeless contours avoid diffraction effects – two solutions for which Genelec claims "excellent resolution and stable imaging" from these fully active boxes. Increasing sizes lower the F3 bass response from 73Hz to 45Hz respectively. The fat lady of the group is the 8260A, a long-standing model whose €8.000 sticker signifies very different technical advances by way of three-way architecture (coax plus woofer) and comprehensive DSP facilities for speaker/room corrections via digital crossovers and compensation curves.